Sprains and strains – Injuries to ligaments (sprains) or muscles or tendons (strains) should be graded on whether tissue is stretched, partially torn or fully torn, as healing time varies. Fractures – Injuries that involve a cracked or broken bone need to be assessed to determine whether healing requires casting or surgery. Concussions – LVHN concussion programs can assess traumatic brain injury. “Having a neuropsychiatric screening before starting a sport (such as ImPACT® test) can provide a baseline for comparison that may aid recovery and return to play,” Canlas says. Taking these steps immediately after an injury can speed healing, reduce pain and control swelling. Protection: Use crutches or braces to stabilize or take weight off an injured body part and prevent further injury. Rest: Stop activity as soon as you’re hurt and get evaluated. Playing through pain can make an injury worse and delay recovery. Ice: Wrap a cold pack or bag of ice or frozen peas in a cloth (to prevent frostbite) and apply to the injury for 10 to 20 minutes twice a day or as needed to ease pain, reduce inflammation and control swelling. Compression: Snugly wrap the injured area with an elastic bandage such as an ACE bandage to provide support and minimize swelling. Elevation: Raise the injured body part above the level of your heart to reduce pain and swelling. Make an appointment. 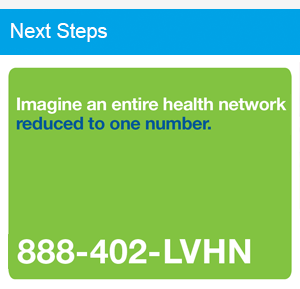 Call 888-402-LVHN (5846) to make an appointment with a sports medicine provider in your area.